"The Hero of Color City" was made for five-year-olds and is unashamedly derivative of "Toy Story." The computer-generated animation is second-tier next to the big dogs at Disney, Pixar and Dreamworks, but there will be no arguing that it isn't the cinematic equivalent of a rainbowor, for that matter, a box of crayons. One of those coloring instruments is the perpetually fearful Yellow (voiced by Christina Ricci), who yearns to be as cool as Blue (Wayne Brady), as headstrong as Red (Rosie Perez), and as organized as Green (Craig Ferguson). In the bedroom of their slumbering young owner, Ben (E.G. Daily), Yellow and her pals are transported by way of his crayon box to the candy-toned land of Color City. Their world is threatened, however, when Ben's unfinished drawing of King Scrawl shows up to steal their bright hues. "The Hero of Color City" includes some unexpected references2008's "Gran Torino" ("Get off my lawn!") and YouTube videos ("Double rainbow! "), for startersbut the gist of the story is simple and sweet enough, if on the forgettable side. Its most egregious moment might actually be its last, a lame, inappropriate mid-end-credits tag that turns into a PSA for recycling crayons at crayoncollection.org. 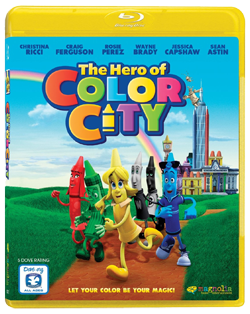 (Release Date: December 2, 2014)  "The Hero of Color City" bursts forth with a cornucopia of primary tints, all of them made exceedingly vibrant in Magnolia Pictures' beautiful 1080p transfer. From the swirling color river that Yellow sails down to the seaside marina and Madame Pink's Spa, the landscape is an attractive one even if the sophistication of the animation sometimes feels a little homegrown. Fortunately, lines are sharp, detail and clarity are bountiful, and other technical attributes are flaw-free. The 5.1. HD-DTS Master Audio gets the job done, but its greatest failing is that it never once calls attention to itself. The soundtrack and dialogue are never less than clear, but the surrounds are used subtly and most of the audio seems to stick to the front channels. Running a fast and painless 77 minutes, "The Hero of Color City" will divert young children and is palatable enough to not annoy older viewers. Are the songs and story rather disposable? Sure, but director Frank Gladstone has made a children's pic with good-hearted messages about friendship, teamwork, and overcoming fears. It's difficult to fault a movie of this sort too much when it is this inoffensive.